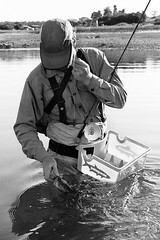 Here's a look at the back of the S8 Deep Wading Jacket. Click on the shot and mouse over the comment boxes to learn more. The redesigned DWJ should be onshelf by mid-January. Who is your closest dealer Chase? I live in northwest arkansas. The local fly shop, McLellan's, carries patagonia. I was about to buy the current version but i think i might wait. Is there a big price difference in the new one? 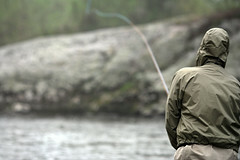 The redesigned Deep Wading Jacket MSR is $250 and weighs approx. 11oz.